Marvel’s Spider-Man! Assassin’s Creed Odyssey! Crumbs, Call of Duty: Black Ops 4 is out next week! And then there’s Red Dead Redemption 2 lingering tantalisingly on the horizon. Your weekly WAYP is heating up, so enough of the awkward pre-ambles – let’s get stuck in. I finished the story in Marvel's Spider-Man last night, so I'm now mopping up the remainder of New York City's hidden secrets. Insomniac Games did a great job with this one – I thoroughly enjoyed it. It's all about Assassin's Creed Odyssey this weekend as I continue my quest for Super Sick Loot. The issue with a gigantic game like this is I don't know when I'm supposed to stop playing it and move on to something else. On what is forecast to be quite a dreary weekend, I’ll be treating myself to some fun in the sun with Overcooked 2’s Surf ‘n’ Turf DLC. If that gets a little too hot to handle, I’ll also be checking out the absurd-looking Pato Box. This weekend I'll be spending a good chunk of time roaming the open roads of the United Kingdom in Forza Horizon 4 while chipping away at Metro 2033 Redux to hopefully get all caught up in time for Metro Exodus. I’ve been playing Marvel’s Spider-Man intermittently since launch but just haven’t found the time to fully commit. Having finally carved out some time to myself this weekend, I intend to give it a real go. A couple of my friends surprised me with a sealed, boxed copy of The Ratchet & Clank Trilogy on PS Vita as a gift this week. I'll be away visiting family, but I'll still have a mini Insomniac Games retro celebration by playing the original Ratchet & Clank, so this weekend I'm gonna first-party like it's 2002. I'm finally working my way through Ni No Kuni 2 and it's weird because other than the glorious art style it doesn't seem to be very much like the original game at all. I loved the first one, and I'm loving this one too – albeit for largely different reasons. This is probably going to be the latest Platinum to add to the collection all being well. I'll be playing more Assassin's Creed Odyssey this weekend, the ancient land of Greece has most definitely got its claws in me. Elsewhere, I'll put more time into FIFA 19 and finish up my playthrough of Evasion for review. This weekend, I’m endeavouring to finish up that little game about an arachnid man who likes punching people. I’m also hoping for some multiplayer action on the now classic arcade game Ultimate Chicken Horse locally with some friends. It’ll be a hoot! Or a cluck! Or a neigh! I’ve been plodding through Hollow Knight. But with Assassin’s Creed Odyssey giving me the eye from my shelf, it’s likely I’ll cave to temptation and load that up after work – provided of course my busy shift doesn’t see me nestled in bed at the first given opportunity. I’ve been playing The Long Dark and for good reason to: the game has recently received a retail version and it may be one of the most authentic survival experiences to date. With stunningly soft visuals, striking sunsets, and a engaging story mode The Long Dark is near perfection. So with football season upon us I have had the itch to play Mutant Football League, so I will be playing that along with Capcom Beat 'Em Up Bundle and a bit of Arena of Valor. Is this the longest WAYP since records began? It may very well be, y'know! Let's see if we can break a comments record below. Have at it. ...and I've got a clear two weeks before the next new release hits for me, so I guess it's backlog time! Yaaaay!! Still spider-man, everytime I advance the story, a new side quest open, now I want to clear all demon crime and harry osborne lab. The hell that is a weekend cinema screening (Venom which is meant to be awful, worse luck) followed by Forza Horizon 4. I've never played a game with a real life setting that I know well(in this case Edinburgh) so it's really interesting,as well as being a brilliant game. I will continue exploring the darker corners of the human psyche. Looking to finish Here They Lie tonight and start Amnesia: The Dark Descent tomorrow. I started a Nier play through last night, I'm most of the way through the first run in only a few hours. Completely ignoring side quests and upgrades so far. The problem is I'm like level 12 fighting level 20-25s so just spamming healing items lol. I'll also play some Dirt 4. Tonight I'm off to see 2001 at the cinema, a 70mm print, bet it looks the same though! (Well actually it's "unrestored" so it'll look worse. Funny how we pay to see stuff worse now!) Hard to believe it's a 50 year old film, though. Dream Drop Distance HD on Critical. Just a boss away from the final world. Still DQXI and Hollow Knight, seem to uncovered a fair bit of the map in hollow knight now but must need double jump and something to destroy barriers but guess i'll just keep looking! God of War again. Lol. Game of the gen player. Word up son. I’ll be doing some travel this weekend, so the PS4 will be dormant. I will take Mr. Vita along and see if I can get back into some portable goodies. Like Trails of Cold Steel. @kyleforrester87 That's odd. The 4K restored print is doing the rounds and the blu-ray is out in a few weeks. It's amazing on the big screen. I'm being dragged to Venom so I envy you. Just beat Spiderman 👌🏾 probably gonna start up DQ11 and some Monster Hunter. Transformers: Devastation, one of the best things i ever got through PS Plus. This time i looked up a guide and finally learned how layered this game really is. Gotta help me wait for DMC5. Also still replaying RE7 and checking out Q.U.B.E. Astro bot all the way. Wow so much fun and creativity. Seriously impressive title and just want more levels. @LaNooch1978 screw Venom. I'm planning a double header next weekend for The First Man and Mandy though, I think they are both out then, anyway. Astro Bot! It's genuinely jaw dropping . I was just grinning from ear to ear during the first boss battle. I can't wait for PSVR2 on PS5. Sony needs to roll out PSVR demo stations with Astro Bot. Everyone needs to experience this game. Mainly Forza Horizon 4, Assassin's Creed Odyssey and Shadow of the Tomb Raider which I'm trying to finish before RDR2 comes out. If time will also play some FIFA 19 and F1 2018. Finished Spider-Man a few nights ago - will do new game plus at some point but probably not until the new year now. @kyleforrester87 I know. I'm with the niece and nephew this evening and it was Venom or A Star Is Born so you can guess which they picked.I've heard very good things about both the movies you mentioned,but I can't stick Nicholas Cage any more I'm afraid. Continuing with Dragon Quest XI. It's very beguiling and lovely as it has been the past month. On handheld I continue the Adventures of Jack and Rose (a.ka. Metal Gear Solid 2) and have almost finished Dragon Quest Heroes Rocket Slime which I shall play tomorrow while watching Xena. @RogerRoger Do you have anything awesome in your backlog you're itching to play? @LaNooch1978 Ever-so-slightly jealous of you; not for Venom (even I have standards) but for Forza Horizon 4, because of the Bond cars DLC. Do you have it? I'll be playing more Spiderman. I am not very far in the game, because every time I see a crime going on, I feel it's my duty to stop it. Being Spiderman is hard work. I'll also be playing more Forza Horizon 4, I keep forgetting that I need to drive on the left hand side. Is it true that there are all these stone walls on each side of the road? I haven't driven in England, but I have driven in Ireland, and that's one of the things I've noticed, that all the roads have stone walls on each side. I also noticed that the roads are super narrow. @RogerRoger Haha. I know you have standards! The Bond cars are what convinced me to buy the full game and not just play it on Game Pass. Also the reason why I can't afford Assassins Creed until next month! @RogerRoger Your GIF is so satisfying to watch. I know I said it last week, but this week I mean it. All I have left are a few challenges to get the gold and the rest of the bases in Spidey, then I'll have 100% and the platinum. The challenges are tough, but fun. @mookysam Well, I've got Shenmue I & II still sealed on my shelf, so I might be tempted to tackle the first one if I think I can play it without rushing. I've also got Jak 3 and Jak X as PS2 Classics on my PS4. After the semi-serious tone of Tomb Raider, I'm really in the mood for some fun nonsense, but that next new release in two weeks is LEGO DC Super-Villains, which would've been the perfect thing to switch to this weekend. I don't wanna get to that after a fortnight of light, fluffy gameplay and be looking for something more substantial. Could be that Shenmue is the perfect fit, actually. Thanks for asking; helped me decide! @FullbringIchigo Isn't it interesting how an inexperienced player could button mash their way through the KH games but when you have such a restriction such as kingdom key only or zero xp you really pay attention to the enemy attack prompts and revenge values. Isn't revisting the whole series again just wonderful though. @LaNooch1978 In the absence of the Vanish, please take the Lotus Esprit, Citroen 2CV and BMW Z8 for a spin on my behalf. @RogerRoger Will do,amigo. The V8 Vantage from "The Living Daylights" has been my favourite since I was a nipper,though. ...would've been perfect if Pierce Brosnan was driving. I have too much choice (not a bad thing) as I still have Spider-Man to get through as well as start Shadow of the Tomb Raider, Assassins Creed: Odyssey and Forza Horizon 4 with Red Dead Redemption 2 due in couple of weeks time as well. @R1spam Yeah it does. It's mainly The Royal Mile/Princes Street as you would imagine but it's pretty accurate. AC Odyssey all the way. Fantastic game. Where I live and (used to) drive, there is a lot of dry stone walling, high banks or low ditches, hedges/trees etc very close to the road - no pavements and narrow roads - quite a few single track roads with few passing points that usually end up with an impasse as you both wait to see who will reverse back to a passing point. Its generally only the A or M roads that have more than 1 lane for each direction. There are still places that haven't changed much since the horse or horse and carriage was the only form of transport (other than your own 2 legs of course) and therefore don't have room for 2 cars and pavements. Original Sin II. I'm starting to really get into it now. Loving my party. Hey guys, I’m currently playing Muramasa’s Rebirth for the Vita. It’s a really fun sidescroller hack-n-slash similar in gameplay to Dragon’s Crown. Going for the trophies currently and I was very surprised that there are no less than 4 story DLC for this game. So looks like I’ll be playing it for a while. @BAMozzy thanks for the response! That's cool that Forza got it right then, minus the exploding walls. When we were in Ireland, I drove down this extremely narrow road in Cork, with cars parked on each side of the road. I was trying to find my way out of the city, turns out the road I took was a dead end. I had to back out the whole length of the road. It was super stressful lol. A got help from someone who lived there to back the car out and to get back on the highway. I did scrap up the car on a stone wall...good thing for insurance! I'll be playing a bit of Dishonored 2! I finished the game a few weeks after it was released and now I wanted to experience the time travel level again. This game keeps surprising me. Also I got a great deal by buying Doom and Marvel vs Capcom... So I'll give them a shot. AC:O and watching the Chiefs and the best young QB in the NFL. I've been playing NieR: Automata the last few days, often for 4 - 5 hours at a time. In the middle of the second route now. Excellent game! Mega Man 11 and maybe some cleanup in Spiderman. I'm also playing Ghost Recon Wildlands again, and I just found out Ubisoft FINALLY added the Benelli M4 to that game (seriously, what took so long?). I love that shotgun! Finally earned the Platinum for Spiderman a few days ago so really chuffed about that.Brilliant game although it felt that out of the thirty or so hours it took me to complete only about 10 or less of those was for the story campaign which felt too short. Dragon Quest XI has been taking up a good chunk of my gaming time obviously as it is just so darn good!I think it's possible i may even get the plat for this game too.Fantastic JRPG that was worth the wait! Will also be playing a little of Xenoblade Chronicles 2..the game that has an endless supply of content and Etrian Odyssey on the 3ds. @Splat I am still needing to finish that myself especially with Odyssey now upon us. It's really a great game and IMO what the Assassin Creed series needed. If this is your first time playing it, you are in for a treat. @LaNooch1978...I wonder how driving round Edinburgh in FH4 will hold up against the unadulterated joy of racing mini coopers around those same streets in PGR back in the day...good times!! Still playing Nier Automata even though I've been saying for the past few weeks that I'm about done with that game. I wasn't originally planning to get the platinum trophy, but I'm getting close to that now, so I might do that. Also been enjoying playing more GTA V, and I'll likely play a little bit more of Shin Megami Tensei Devil Survivor Overclocked as well. Still at it with Shadow of the Tomb Raider. Actually playing a little bit of Marvel vs Capcom Infinite for my fighting game fix. Might throw in some Street Fighter V in there. Hollow knight, really need to get back to DQXI. But, will probably just play HK. @RogerRoger How do you add GIFs? Cause I've no clue. Okami HD in theory. But my wife has got hold of the Wipeout Collection demo and isn't letting go. Looks like this game is getting bought at some point. @Kyroki Upload your .gif to an image hosting site, then put its URL in image tags like these: (img)insert-gif-url-here(/img) only using square brackets [like these] instead of round ones. EDIT: Progress, but I can't get it to play. Busy gaming weekend planned with shadow of the tomb raider, Spiderman, DQXI, and Mega Man 11! Astro bot, and thumper on PSVR. @Kyroki Make sure you upload your .gif to an image host that supports .gifs, like Imgur, otherwise it'll get converted into a still image. Also ensure that the URL ends in ".gif" rather than .jpg or anything else. But you got the tags bang on! @RogerRoger ^ That's what the link is, but without the tags. Not sure if I'm actually missing something or just plain daft. Assassin's Creed Odyssey!!! I'm 10 hours in after finally deciding that Kassandra is superior (glad I did pick her) and god the map is so freaking huge!!! Also I want to thank Robert for making me buy this one since it's now in my top 3 Assassin's Creed games...I'm loving it and I find it way better than Origins! @ztpayne7 did u finish it, or did you experience it? You know there's 26 different "endings" right? You'll get the best one after about 5 playthroughs......life changing. I didn’t do all the joke endings, but I did do all the main endings. @Kyroki Well, you're at least as daft as me, because I can't think of why that isn't working, either. Sorry. Maybe it's Imgur's fault? @RogerRoger Yeah, screw it. I'm blaming imgur. Thanks anyway though! Finished the Mass Effect 2 platinum and now playing Persona 4 on ps3 for the first time. World of Warships with two buddies once in awhile, I started up Dragon Quest VIII: Journey of the Cursed King on PS2, and I will be firing up Star Ocean: Till The End of Time again on PS4, need to progress more and level up as well. That Is basically all I have been playing, been eyeing System Shock: Enhanced Edition in my games folder on the Twitch Desktop App. Been playing Assassin's Creed Odyssey all day. The exploring is so much fun! Only missions I've been doing are side missions. @FullbringIchigo But you did it. Some bragging rights there for sure. Best feeling in the world when you nail it though right. @TheGamerNextDoor is it as grindy as some people are saying? @Tasuki I was actually talking about Odyssey. I have already played Origins and really enjoyed it and I think Odyssey is even better. @beemo lol nice. Yeah the only place that is similar to the narrow roads are in Hawaii...but not as narrow. 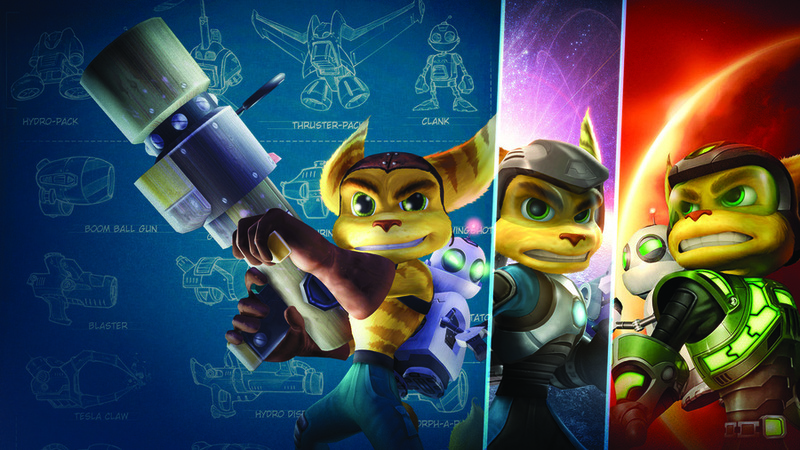 That pic made me think for a second that the PS2 Ratchet games were coming to PS4. If only. Elminage Original via pstv, and this one takes me way back to school days where my friend was the DM and I played a full party of six AD&D characters by myself. That's what this game is- me shuffling through twelve papers trying to find the Thief's lock-pick skill stats and the DM trying to kill me at every turn. Very fun! @beemo I've heard good things about the PGR games but I never really played racers (with the exception of Crash Team Racing and Mario Kart) until my friend showed me Horizon 2 a few years back. I'm not a car guy at all so the more realistic end of the spectrum like Gran Turismo,Forza Motorsports or F1 are a total mystery to me. Horizon is arcadey enough to hold my attention and the add ons like the hotwheels tracks or the Bond vehicles are always a laugh. And of course they always look just stunning. Still plugging away on Yakuza Kiwami 2, Spider-Man and Shadow of the Tomb Raider. Will have at least one of them completed soon. I was hoping to play Assassins Creed Odyssey but I just can't get into it. Finished replaying the re-remaster of KH1 this week, so finally caved and ordered Dragon Quest XI ahead of plan, and have been playing (and massively loving!) that all weekend...my brother's visiting tomorrow for my birthday and he knows I want AC: Odyssey, so may have to take a short break for that. Hoping to plat both though, as I love a good jrpg grind (and AC has recently been leaving out the dreaded MP)! @KingdomHeartsFan Haven't heard anything from people talking about it being grindy but I suppose if you try to rush it then it could feel like it is. I'm just enjoying my time with it and doing one thing at a time so it feels great. It feels a lot like Origins with more in it. Borderlands 2, Dark Souls 3, and I've been playing the Lego Harry potter games with my girlfriend (shut it, she loves them) and have found myself actually enjoying it. Pancakes, coffee, and Lego games. It was a good time! @CD456 Watch Jim Sterling's video on it and you'll probably agree with it. I've just returned from a stag do in Lloret De Mar and I'm cream crackered so probably not much. Actually, maybe some 2064: Read Only Memories on the Vita. Am having a rest from gaming for a couple of weeks. The only spanner in the works to muddle the impressions was... yeah, you guessed it. Yet another combo of "triggers on the touchpad" and "button remapping? Never heard of it, but here's a control mapping option to VIEW the only available scheme". And we're talking a first party blockbuster that was in development since 2011! Guess I'll have to rely on more stealth archery than all of Skyrim memes combined, because handling even one rider at close-to-middle range was challenging. Rost: "Shoot the eye! Shoot the eye!" Me: "I'm trying! Every single time I manage to blindly feel up that R2 "button" and avoid accidentally opening the map with a stray thumb swipe!" I decided to play Wolfenstein the new order for a second time. I'm also playing Captain toad from my backlog on Wii u and I'm playing Gtsport most days. Started out with a few hours on odyssey Friday night but then my kids made me get super mario party and another 2 joy cons and it's rekindled my love for couch co op. Also got overcooked on offer from the switch store and been having mega amounts of fun on that with the family. My wife's been on it all day today and she hates gaming with a passion. It's good to see her addicted and sharing in some gaming. Most fun week I've had gaming for a looooong time. @beemo Imo yes it's worth it but this is my first delve in to Mario party so honestly couldn't compare it the game cube ones which are supposed to be great. All i can say is that me, my wife and kids were having loads of fun last night on it. Controls for the mini games are solid too and make very good use of the motion control and HD rumble. 4 maps in total with 3 unlocked from the start so I'm hoping they add a few in a future update or something. Nothing unfortunately. I had planned to start up Resident Evil 1, but I never got very far...this game is just as difficult as I remember it being when I tried to play the PS1 version ages ago. I may just give up on catching up in time for RE2 and possibly also DMC5 I dunno.